Labor Day weekend has ushered in the month of September, unofficially marking the 2013 autumn season here in St. Louis. Since the kids are now back in school, or off to college, September is a perfect time to plan, design and build a deck, porch or screen room for your home and backyard. The weather is cooler but there is still plenty of time to enjoy your backyard before winter arrives. Outdoor living spaces, today, have become top-tiered projects for every homeowner’s ‘home improvement list’. Decks, porches and screened rooms increase your home’s usable square footage, supply plenty of curb-appeal, provide a substantial ‘return-on-investment’ while creating an ideal spot for your family and friends to enjoy the great outdoors. 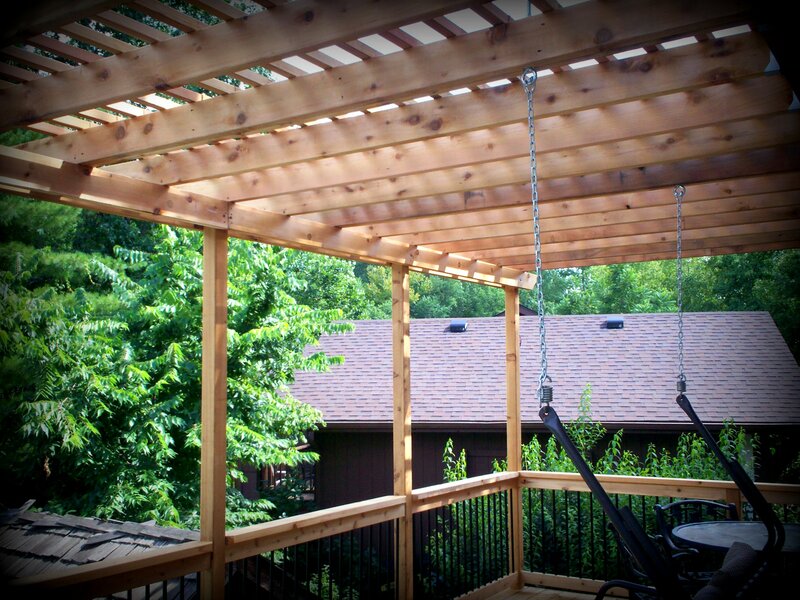 Featured here is an elevated cedar deck and pergola with a built-in, under deck storage area. 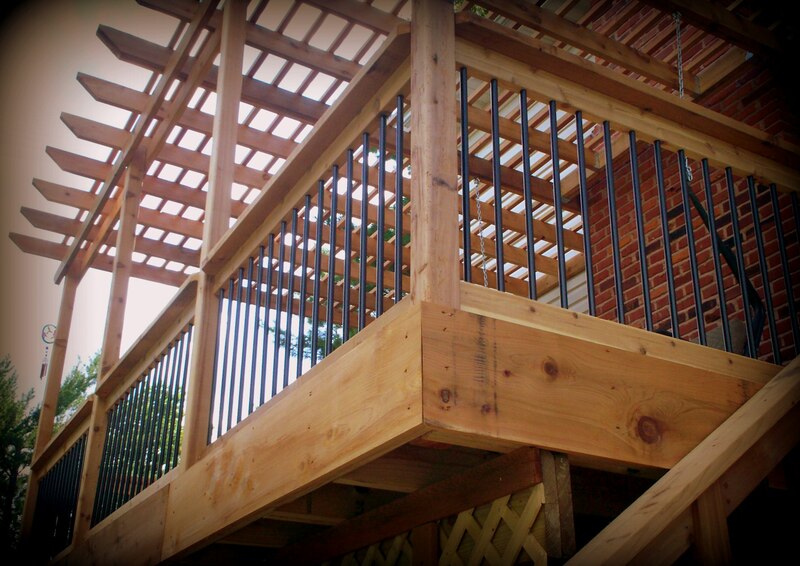 This is a terrific example of a deck designed to fit our customer’s needs, personal style, backyard space and budget. The project is located in St. Louis West County in the Chesterfield area. 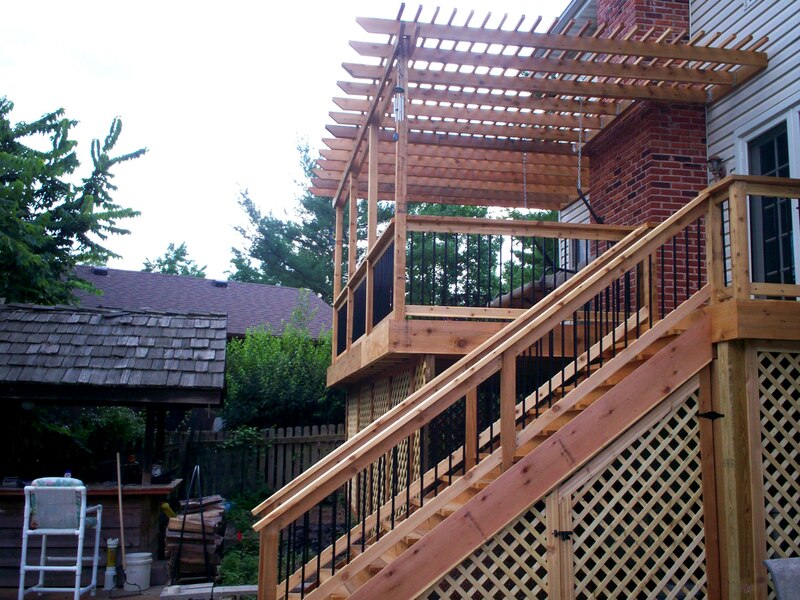 Archadeck designed an elevated cedar deck to connect the home to the backyard with a matching pergola for both shade and style. We designed the deck stairway for maximizing space and efficient traffic flow. The deck railings were built using traditional cedar wood; however, we added black metal balusters for an open, contemporary ‘look’. 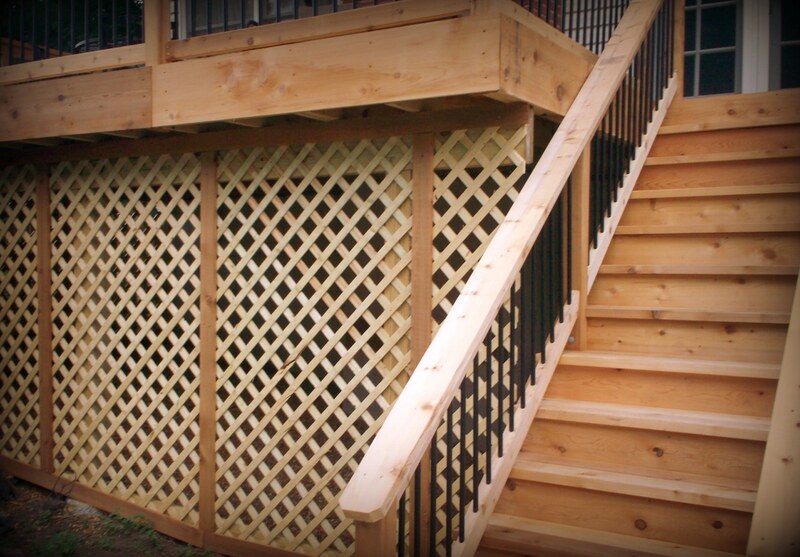 And as a finishing touch, we used a lattice skirt with gated access for a well-ventilated, under deck storage area. The end result: An all-natural cedar deck just outside the kitchen with shade, storage, and an open backyard view … all at an affordable price. Archadeck is located in St. Louis West County and we serve Greater St. Louis, Mo: St. Louis County, West County, South County, St. Charles, St. Charles County and parts of Illinois. Decks of all types are the signature product of Archadeck but we also specialize in other outdoor spaces including porches, screened rooms, gazebos, pavilions, under deck rooms, pool and spa decking and more. « Screened Rooms: Bring the outside, in.